WARNING: Learn how to make MORE money with LESS working Hours! “Imagine finally having enough money and time to visit the places you have always wanted to visit. 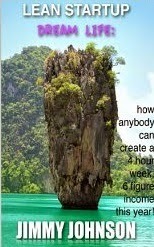 No more slaving for your boss, while making little cash.” YOU TOO CAN DO IT! Jimmy shares with you his success story for setting up his dream business that has made him become financially independent. Through examples and very detailed easy to understand information, Jimmy teaches you which industry to pick, and how to setup and run your business with only a few hours per week of work, and limited overhead. If it worked for him, it will also work for you! - And much more essential information to make your dream come true. You have lived a difficult life, isn’t it time that you get a BREAK? Let Jimmy share with you his story, and teach you the overlooked industry anyone can use to setup their own successful business. You deserve it. Take a look at the sample, or even better, order your copy today, it is a steal deal!